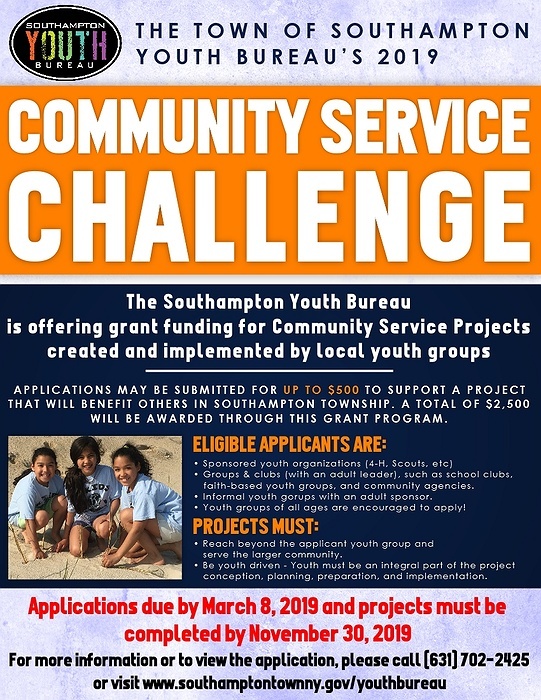 Subject: LongIsland.com - Your Name sent you Event details of "Community Service Challenge"
Applications for the Town of Southampton Youth Bureau’s 2019 Community Service Challenge are now available! The Southampton Youth Bureau, through the Youth Advisory Committee, will be offering community service grants to youth groups in the Town of Southampton. A total of $2,500 in grant money will be awarded through this grant program. If selected, the project must be completed by November 30, 2019. Each community service project must have a positive impact that benefits the surrounding community. Eligible applicants can be sponsored youth organizations such as Scouts or 4H, school clubs, faith-based youth groups, community service organizations, and other youth groups with an adult sponsor. Youth groups of all ages are encouraged to apply. All applications for the Community Service Challenge must be submitted by Friday, March 8, 2019. To pick up an application, please visit www.southamptontownny.gov/youthbureau or stop into the Southampton Youth Bureau’s administrative office located at the Flanders Community Center, 655 Flanders Road. For more information, please call (631) 702-2425.